A documentary for ex-Jehovah’s Witnesses. I just finished college, so I’m hoping to have more updates started for the website soon. In the meantime, a moment of vindication: Yep. Truth be Told will soon be downloadable to anyone who wants it. Use coupon code FACEBOOK5 for $5 off the Deluxe Package. Hi everybody. Despite the prayers of your local Kingdom Halls, I’m not dead. 😛 I’m a busy college boy who hasn’t had time to write much or to fix all the quirks that were left in the aftermath of the big reboot here at AGN. Right now, you find me in the midst of Spring Break. And unlike your Spring Break, I’m here instead of getting drunk or making out with chicks. Wow. Now I’m just sad. Avoidance-mode engaged! This was the film’s second public showing in New York. A number of ex-Witnesses were there (wish I could have been one of them). But here’s the sweet part: 1) it took place less than two miles away from Bethel headquarters 2) it took place the day after the Memorial 3) the video shows Gregorio and others blanketing the general area near Bethel with flyers that promote the documentary. This features an interview with Gregorio himself! If you’d like to read my interview with Gregorio, get it here. It looks like Atheism TV will be running a story about it as well, so stay tuned over the next week or so for that. That “new light” refers to the Body’s decision to declare themselves the Faithful and Discrete Slave. Whether someone is Atheist, Agnostic, Muslim, Hindu, Jewish, – or yes, even Christian – all can identify at times with the cry, “Lord, Save Us from Your Followers!” Fed up with the divisive bumper sticker mentality overtaking America, director (and follower) Dan Merchant donned his Bumper Sticker Man suit and set out on the daring search for meaningful dialogue and the true face of faith. Yes, it’s on Hulu…sorry. But if you have Netflix, you can actually watch it without the commercials! Deliverance at Hand! is James Zimmerman’s account of growing up as a zealous Jehovah’s Witness in the Twin Cities area of Minnesota. When parents disown their teenaged or young adult children, they miss out on seeing them mature. I daydream about the conversation I’d have with my mother now that I am in my mid-thirties. I’d love for her to get to know me. What would she think of her grown up daughter? I have been advocating Gregorio Smith‘s Truth Be Told documentary about ex-Jehovah’s Witnesses since I first heard about it from a member of the production staff. So I was very excited when Gregorio emailed me with more information a few weeks ago. He even agreed to give me an interview. Here’s a comment about the documentary from its creator that I thought was worth sharing. Especially in light of any criticism that may follow from the Society or Jehovah’s Witnesses. 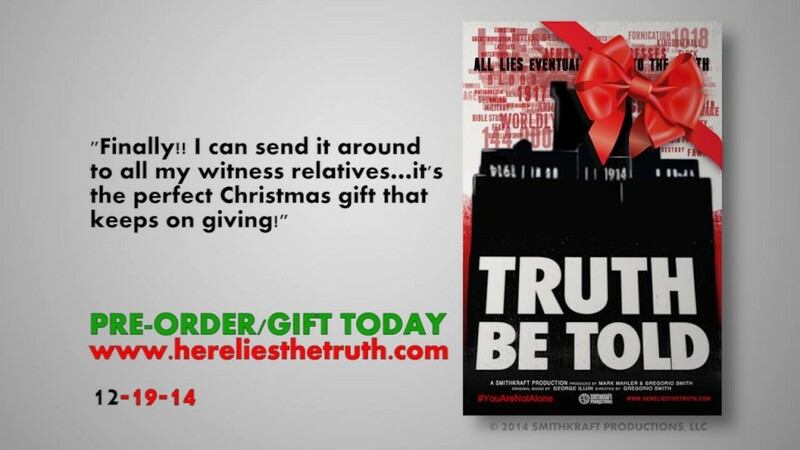 Per the official synopsis, TRUTH BE TOLD is not an indictment of religion but rather a retrospective. The purpose of the movie is to provide a comprehensive forum for anyone that has a story to share – to start a new conversation intended to heal, not hurt. And while the ultimate product may not be even-handed, it will be honest. I’m sure many of you were wondering if Gregorio had any personal experience as one of Jehovah’s Witnesses, or if he was coming at this completely from the outside. I asked him some questions about his background, and he was very open in providing details. The truth has absolutely nothing to fear from investigation. If something is true, the more you investigate it, the more brightly the light should shine and expose that truth.